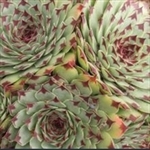 Question: what is the plural of Sempervivum? 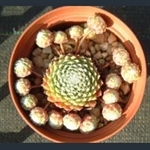 Anyway, the houseleeks all form tight rosettes of fleshy leaves, each rosette producing a number of offsets each year, so that a spreading, tight mat soon forms. After a few years a rosette may decide to flower, in which case it sends up a short stem, topped with a cluster of flowers, pink or yellow. It then dies, its place in the mat taken by youngsters. There are hundreds of named varieties, of which we offer some of the more distinctive ones, including some new varieties, bred by the late Matthew Ruane at Brynhyfryd Nursery. See also Jovibarba. A wild form, with small, green and red leaved, cobwebbed rosettes. Mat-forming clusters of deep red rosettes, covered by a white cobweb of hairs. Small, green and red leaved, highly cobwebbed rosettes. Bright green foliage with russet outer leaves. Rosettes of succulent green foliage edged with dark red. Makes huge rosettes, olive green with dark red leaf tips. Unusual new variety with rosettes sandy coloured with red leaf tips. Very hairy but flourishes unprotected outside. Pale yellow flowers. Rosettes covered in bloom, dusky grey green at centre, rose pink at edge. Rosettes of lime green succulent leaves with dusky pink tips. Pointed leaves, green tipped and red in the centre, in compact rosettes. Mat-forming rosette with red and green foliage. 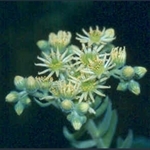 Yellow-green leaves with mahogany tips and pale pink flowers. Rosettes of red leaves, green at the tip, the young ones also green at the base. Glossy, dark red leaves, olive at the centre. Softly hairy rosettes, deep red or green depending on the season. 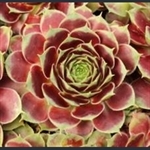 Rosettes of succulent dark red foliage tipped with light green.